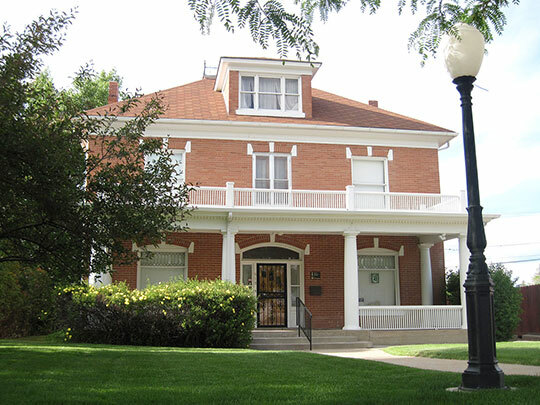 Casper City Hall is located at 200 North David Street, Casper, WY 82601; phone: 307-235-8400. Photo: Bishop House, ca. 1907, 818 East 2nd Street, Casper, WY. Listed on the National Register of Historic Places in 2001. Photographed by User:Chevsapher (own work), 2012, [cc0-by-1.0 (creativecommons.org/publicdomain/zero/1.0/deed.en], via Wikimedia Commons, accessed August, 2014. Casper had its roots as a railroad town. It was first laid out in 1888 when the Chicago and North Western Railroad extended its line westward from Nebraska, laying its tracks up the North Platte River Valley through Douglas and Glenrock. Casper was surrounded by ranching country, and it served as a commercial center for the far-flung ranches and as a major rail shipping point for livestock and agricultural products. At first the town grew slowly, and by 1900 the population was less than nine hundred. However, the commercial production of oil in the area, starting in the 1910s and 1920s, quickly changed the character of the Casper community. The great Salt Creek Oil Field, located about fifty miles north of Casper, was extensively developed after 1910. Casper was strategically located as the nearest railhead to the field, and it became the major shipping point for oil products. Refineries and tanks farms were built at Casper, and a system of pipelines was laid connecting them to the field. The Midwest Refining Company and Standard Oil Company of Indiana invested heavily in the field and assured a bright future for Salt Creek. As a result of these developments, Casper experienced an oil boom period that began in 1913-14 and continued well into the next decade. The major oil concerns established their headquarters in Casper, providing employment and injecting capital into the local economy. The population multiplied to 2,639 in 1910 and nearly doubled in the next five years to 4,040. The new prosperity accelerated community expansion and the construction of buildings. Robert G. Rosenberg, Historian, Rosenberg Historical Consultants, Masonic Temple, Casper, Wyoming, nomination document, 2005, National Park Service, National Register of Historic Places, Washington, D.C.